Yesterday I had my application to transfer interview. The interview as one would expect was quite tough and a couple of the questions were difficult to answer. The interview started with a review of the parts of my research that worked well but as this was more concerned with critical aspects of the research these were not discussed. Much was made of a need to be more explicit with my conceptual framework with my regards to my use of motivation within the research. However, the theory and concepts relating to creativity, generations and literacy were judged to be more clearly argued. About half an hour after the interview I was called to be told that the panel had recommended that I transfer to PhD status. This was more of a relief than an celebration. However I did go out last night. 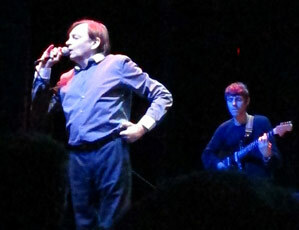 I’d already got tickets to see my favourite band, The Fall, (left) at the indigO2, a few months back. This helped take my mind off the events of the interview, although I have slightly wooly head this morning! Anyway now I can get back to progressing forward with my research without the worry of having to re-apply in the summer.